Toward the end of 2015, the Russian Federation made several breakthroughs in its relations with Vietnam, including agreements for mutual cooperation between Moscow and Hanoi on issues such as anti-corruption, defense, and trade. While the court of global opinion has largely turned against Russia due to its military actions abroad, in Vietnam, Russia enjoys broad support from the population at large. 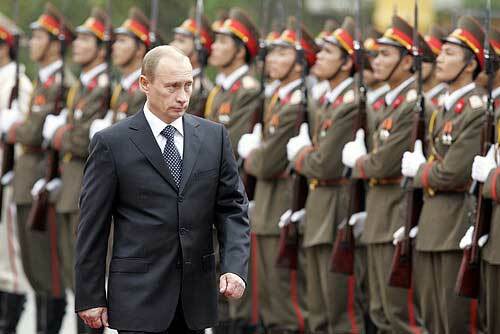 According to a poll from the Pew Research Center, 75 percent of Vietnamese have a favorable opinion of Russia. At the official level, Vietnam’s foreign minister, Phạm Bình Minh, has recently voiced support for a greater Russian role in global affairs. According to Maria Zelenkova, a research fellow at the Russian Institute of Strategic Studies, Vietnam’s foreign policy is based upon a desire to develop relations with China, Russia, and the United States in the form of a multi-vector foreign policy. With tensions mounting in the South China Sea, it stands to reason that Hanoi would pursue closer ties to a power besides China and the United States. The pursuit of a multi-vector type of foreign policy is not dissimilar to those of other countries such as Kazakhstan and Mongolia, which must contend with the reality of sharing borders simultaneously with China and Russia. As tensions rise between China and Vietnam in the South China Sea, Vietnam has concrete reasons to approach Russia seeking a deeper level of partnership. Yet Moscow’s willingness to develop a closer relationship with Hanoi must somehow invariably also serve Russia’s own self interest. This is especially true if Russia risks becoming enmeshed or otherwise involved against its better interests in the South China Sea dispute. Thus the question arises: what benefit is there for Russia in pursuing closer security relations with Vietnam? In addition to strategic deterrence, one of the most crucial factors and main driving forces in current Russian security policy is the ability to secure itself on its geographic flanks against a plethora of potential adversaries and threats. This is one of the main reasons why Russia has sought to keep countries on its periphery in its geopolitical orbit, in order to create a security belt comprised of friendly states. Given this facet of Russian security policy, it may seem somewhat illogical that Russia would expend energy to develop security ties with Vietnam. This is particularly given the vast distance between Russia and Vietnam and the fact that no direct threat to Russian security emanates from Southeast Asia. Furthermore, Russia already has several other considerations closer to its peripheral areas, such as the situation in Ukraine and its engagement in Syria (which has larger reverberations for Russia’s security vis-à-vis NATO). The most important factor driving Russia’s new rapprochement with Vietnam is not peripheral security, but rather to create a hedge against the rise of China. For all of the talk of the growing China-Russia partnership, relations between Beijing and Moscow remain cautious. As Elizabeth Wishnick argues, Russia’s declared ambitions to become a major power in the Asia-Pacific (specifically in East Asia) depend not on its burgeoning partnership with China, but it’s ability to balance China in East Asia. Indeed, it is only natural that Russia would cooperate with China insofar as doing so would serve Russia’s own national interests. When it becomes contrary to Russian interests to have a partnership with China, however Russia will obviously seek ways to balance Chinese power. As a case in point, Russian energy companies have expanded their cooperation with other countries in the South China Sea region, including Vietnam. In response to this, China has called, without directly stating it, for Russia to refrain from getting involved in the ongoing regional dispute. In other words, the main driver of Russia’s security policy toward Vietnam isn’t Russia’s own immediate peripheral security but the ability to augment and project its influence in the Asia-Pacific in light of China’s rising star. As part of Russia’s so-called “pivot to the East”, Russian policymakers see a string Russian position, whether diplomatically, economically or militarily, as being essential for Russia’s goal of returning as a great global power. Indeed, Russia fears becoming a second-rate Asian power subordinate to China, and will heartily welcome alternate partners who can assist Moscow in becoming more active in Asia-Pacific affairs while avoiding subordination to Beijing. Some consider Japan to be a viable partner for Russia as a counterweight to China, yet the Russo-Japanese relationship remains problematic, not least because of the festering dispute over the Kuril Islands. Therefore, Vietnam presents itself to Russia a country of interest in its endeavor to balance China. Issues of geography (and thus, the attendant issues of logistics and strategic presence) notwithstanding, Russia and Vietnam have initiated cooperation in the military sphere. This cooperation has, thus far, been limited to arms sales and technology transfer. Nevertheless, such cooperation will have a role to play in enabling Vietnam to defend itself against growing Chinese power. Vietnam has also recently re-opened the former Soviet base at Cam Ranh to the Russian navy and air force. Furthermore, both countries have discussed the possibility of deeper collaboration in terms of confidence building measures. Russia has announced that it will participate in a joint naval exercise in the South China Sea in 2016. Russian media have speculated that the drill will take place in May. For Russia, Vietnam represents an important node in East Asia whereby Russia can actively attempt to balance against Chinese power and thus strengthen its geopolitical and strategic position in East Asia. As Vietnam seeks to diversity its international partnerships, it sees an opening with Russia. In turn, Russia also sees in Vietnam a chance to expand its own Asian influence, and is not wasting the opportunity.